At Latin Lawyer one of the subjects closest to our hearts and which we take most pleasure in reporting on is pro bono. We have surveyed law firms’ institutionalisation of pro bono practices for the past 11 years and take heart from the results of the 2018 survey (which we conducted with The Cyrus R. Vance Center for International Justice). We found that more and more firms are assembling the necessary ingredients to be able to deliver pro bono. Their efforts are part of a broader pro bono environment that encompasses the growing clearing house network in Latin America. 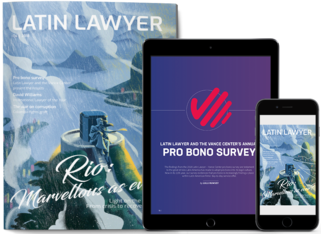 The Pro Bono Declaration of the Americas celebrated its 10th anniversary in 2018, making this issue a good place to reflect on its contribution to securing access to justice to those without the funds to pay for it. This issue also addresses one of the biggest talking points in Latin America in recent years: corruption. At the epicentre of the graft probe centred on Brazil’s Petrobras was the city of Rio de Janeiro, which was hammered by plummeting oil prices at around the same period. With Rio now appearing to turn a corner, its legal community reveal how they weathered the storm. Colombia is facing its own battle against graft. At a roundtable in Bogotá last year we discovered that top of law firm leaders’ wish lists is greater enforcement of the legislation that currently exists to tackle such crimes. Meanwhile, the effect of Argentina’s “notebooks” scandal on deal flow is still far from certain. Also in this issue, we speak to Simpson Thacher & Bartlett LLP’s David Williams, who was the recipient of Latin Lawyer’s International Lawyer of the Year Award in 2018, in acknowledgement of his lifelong legal career in the region. Partner participation in pro bono is still low, despite clearing houses’ best efforts to get the senior level of law firms involved. While firms can still make a big contribution to pro bono without partner involvement, the fact remains the partnership holds the power to effect institutional change necessary to increase the volume of work done. In early 2018, Óscar Centeno, a driver for an ex-official in Argentina’s ministry of public planning, turned over a box of handwritten notebooks to newspaper La Nación. In doing so, he sparked Argentina’s largest ever investigation into graft.